I have two borders inside the greenhouse, which I dig up every year, replacing old compost with new. One end of the greenhouse has a propagating bench running its full width. It is built on a marine ply base with slated timber sides made out of old skirting boards. The whole lot is lined with polythene. I bought a low wattage heating cable, (about 40′ long) and laid it, zigzag fashion on a bed of horticultural sand f(which does not go solid when dry) 10cms deep. I then covered the cable with another four inches of sand and thoroughly wetted the lot before covering with black polythene. The mains powered heating cable, (obtainable as a kit from good garden centres or horticultural suppliers) is connected to a thermostat with a special probe which is buried in the sand. 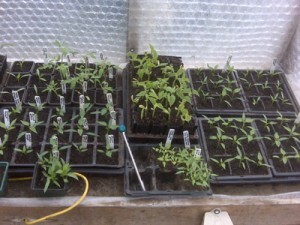 During the summer months the propagator is switched off and used to hold large pots of peppers and chillies. 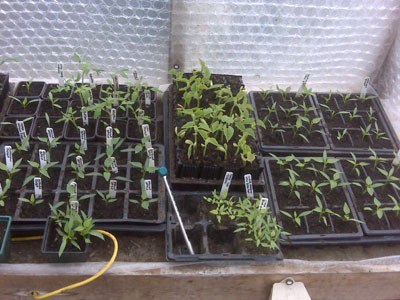 Starting in early January with the first sowings of tomatoes and peppers the propagator is set at between 20 and 24 degrees centigrade. 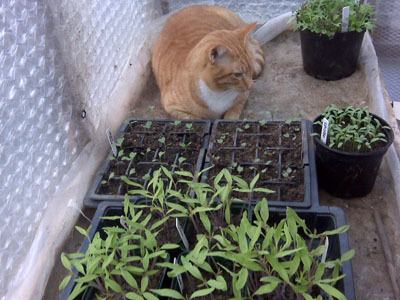 In the autumn when the first pots come in from the garden for overwintering I set the thermostat at about fifty degrees to keep the plants contented. 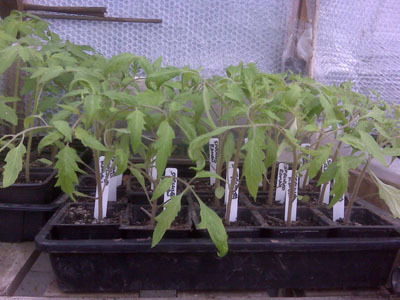 I use a greenhouse electric fan heater to keep the frost out in winter and to maintain a minimum temperature of 10 degrees centigrade when my tomato and pepper seedlings have been transplanted into individual pots to grow on. I find an electric heater much better than a gas or oil type because the fan keeps air circulating and there is less humidity because water vapour is not being created by the burning of gas or oil. My greenhouse on the allotment is used to grow crops throughout the year. 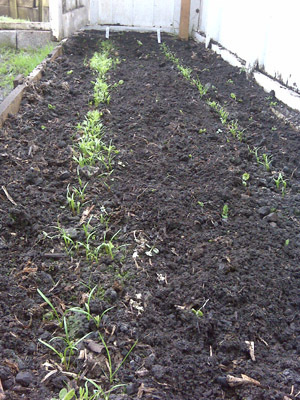 In late February I sowed two types of early carrot, the popular Amsterdam forcing and a very expensive hybrid variety called Ideal which can also been sown in late summer outside. By early April they are up and away. 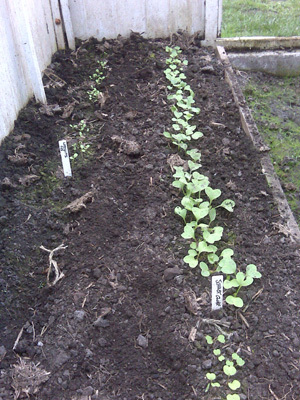 On the other side of the greenhouse I am growing rocket and radishes, and a lovely crisp cos lettuce called Lobjoits which I will plant out under cloches in late April. The rocket, radishes and carrots will all have been harvested by the time I plant up the greenhouse with peppers in May.